Everyone will flip over this moist, delicious buttermilk cake. My friends call it “crack”. No one has to know how EASY it is! If your friends and family are anything like mine, the first bite of this Easy Farmhouse Buttermilk Cake will have them swooning, moaning, sighing and/or saying “Oh, my gosh!”. I saw a picture of this buttermilk cake in an email from King Arthur Flour. The cake looked fabulous and I loved the rustic, charming name. I decided to try out the recipe one day last week, when some friends were coming for lunch. Being a bit lazy (and always in a hurry), I simplified the recipe to involved just one bowl and no mixer. What a winner! 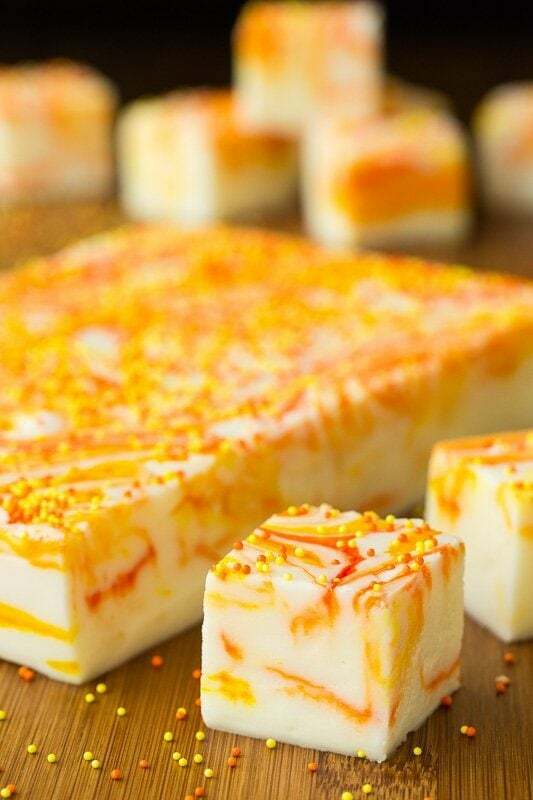 When a recipe is REALLY good my husband calls it “candy”. This cake can definitely be labeled as “candy” both literally and figuratively! 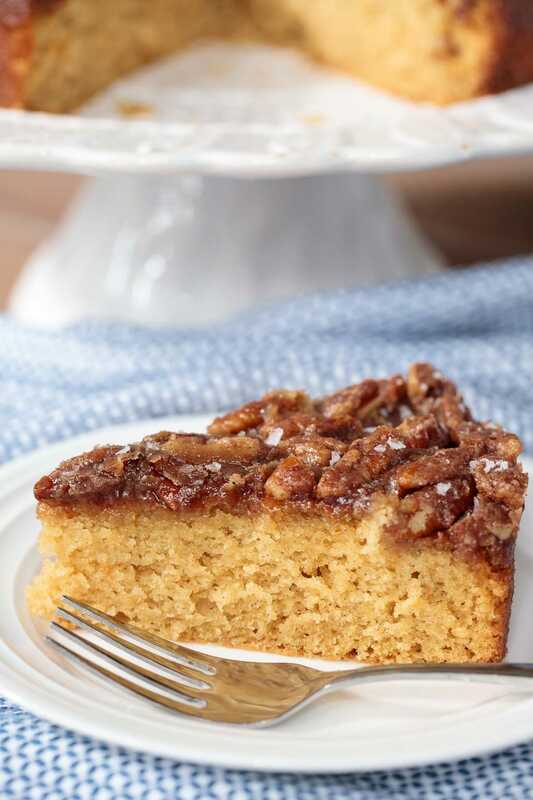 The cake is super moist with lots of flavor, and the topping reminds us of a delicious combination of sticky buns and pecan pie. How quick and easy is this buttermilk cake? I thought you’d never ask, so I’ll give you an example of just how easy it is! Earlier this week, I drove to Memphis to see a play that my 11-year-old granddaughter, Elle was in. Her older sister, Annie (12) stayed at home while we attended the 40-minute play, since she planned to go to another performance. Annie started this buttermilk cake recipe as we were leaving for the play and, by the time we returned, it was done! It was gorgeous and later, when we indulged in Annie’s cake, everyone agreed that this dessert was definitely “blog worthy” (the highest accolade in our family!). What is buttermilk and what kind should I buy? Originally, buttermilk was the liquid left behind after churning butter out of cultured cream. This type of buttermilk is now specifically referred to as traditional buttermilk. The fermented dairy product that is widely available these days at most groceries and markets is cultured buttermilk. Cultured buttermilk is regular dairy milk that has been inoculated with an acidic culture. The acidic culture simulates the naturally occurring bacteria in the traditional product. The result is the characteristic sour taste of buttermilk as well as a thicker product. Sometimes you’ll notice flecks of butter in purchased buttermilk. This is actually butter which has been added by the dairy to simulate the residual flecks of butter that are often left over from the churning process of traditional buttermilk. What kind of buttermilk should I buy? If you check out the dairy shelves of your local grocery, you’ll notice that buttermilk comes in two varieties, whole milk, and low fat. The difference is just as the names imply: whole milk buttermilk is made from whole milk and the low fat from skim or 1% milk. So which should you buy? That’s really just a matter of personal preference. I prefer the whole milk variety when baking, but either one will result in a delicious buttermilk cake in this recipe. And if you’re in a pinch, you can even make your own buttermilk. Check out the Café Tips below for the simple instructions. 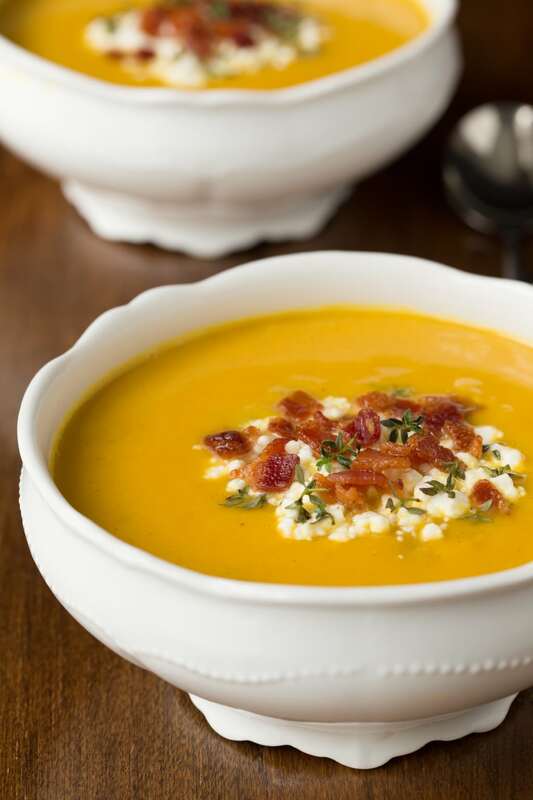 Your recipe is so simple: combine butter and sugar in a bowl, add buttermilk and egg. Stir. Sprinkle dry ingredients over the top, mix, then transfer batter to a pan. Bake. While the cake finishes up in the oven, make the easy topping in the same bowl. Pour topping over the cake and bake a little longer. Cool and ENJOY! Your tender, moist crumb is amazing! 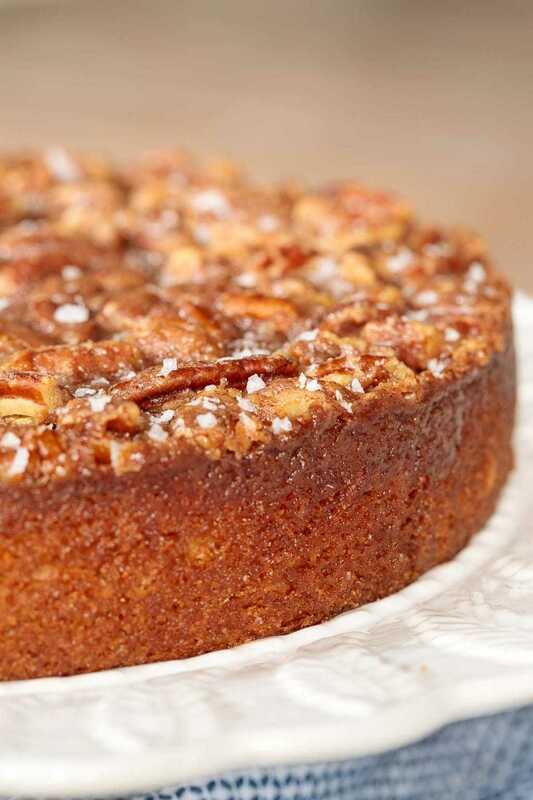 There’s your pecan-praline-like topping, perfectly complementing the light, delicate texture of the cake. Oh my! I love the way the topping seeps down the sides of the cake in the oven, caramelizing and becoming candylike in texture. 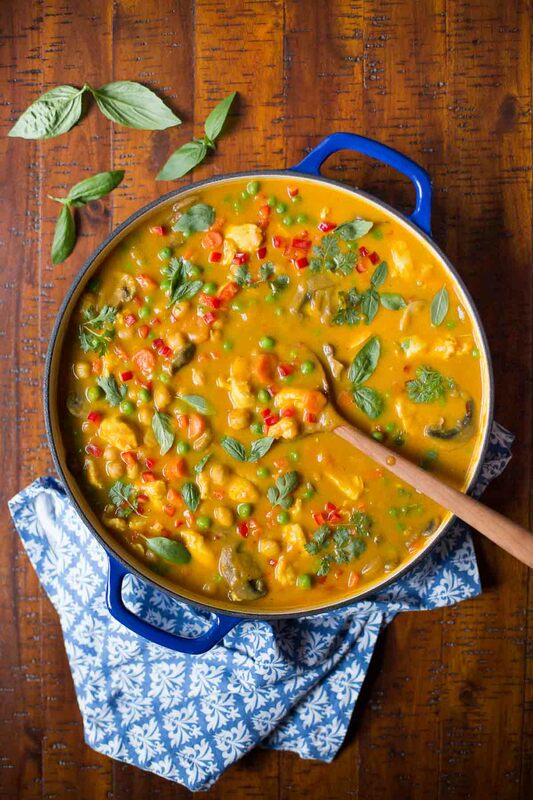 You freeze beautifully so you’re a great recipe to make ahead for guests. I love that you’re crazy delicious whether served warm or at room temperature. You can be dressed up or down (with ice cream, whipped cream, powdered sugar, etc.) making you perfect for breakfast, lunch and/or dinner! 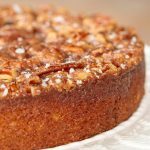 I love to add a sprinkle of flaky sea salt after this cake is baked and has cooled for 15-20 minutes. This is totally optional, but if you like salty-sweet, be sure to try this. I use Maldon Sea Salt. It’s the sea salt preferred by many chefs. Maldon is a flaky sea salt meaning that it’s flat and flaky rather than crystalline in structure, like other sea salts. It’s a finishing salt; in other words, it’s used as the finishing step rather than as a seasoning when cooking. It’s more expensive than other salt, but a box will last a long time. To use Maldon, just take a pinch in your fingers and rub them together over the food. This will cause the large flakes to break apart. Because this recipe doesn’t use an electric mixer, the butter should be VERY soft. Leave it sit at room temperature for several hours or use a microwave at 10% power (for 30 to 90 seconds, depending on the power of your microwave) to soften your butter. No buttermilk? No problem! Just add one tablespoon of white vinegar or lemon juice to a measuring cup. Fill with milk to measure one cup. Allow to sit for 5-10 minutes, then proceed with recipe. This buttermilk cake can be made 8-10 hours in advance and stored at room temperature. 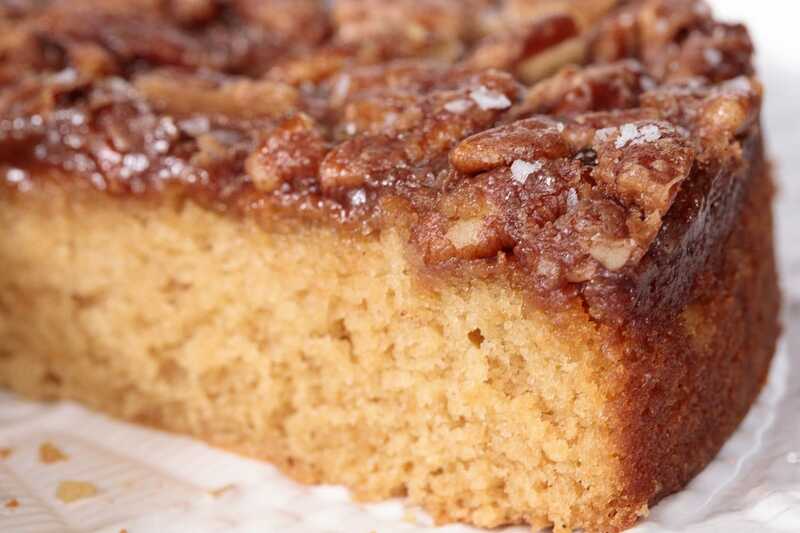 Have extra buttermilk after making this cake? Try out our Ridiculously Easy Buttermilk Biscuits or these Easy Buttermilk Brioche Buns. You’ll find yourself buying buttermilk on a regular basis! Be sure to use a 9-inch cake pan for this buttermilk cake. Round cake pans also come in 8-inch which would be too small and could cause a mess in the oven. For good results, use a straight-sided, fairly heavyweight cake pan. I really like these pans from OXO. 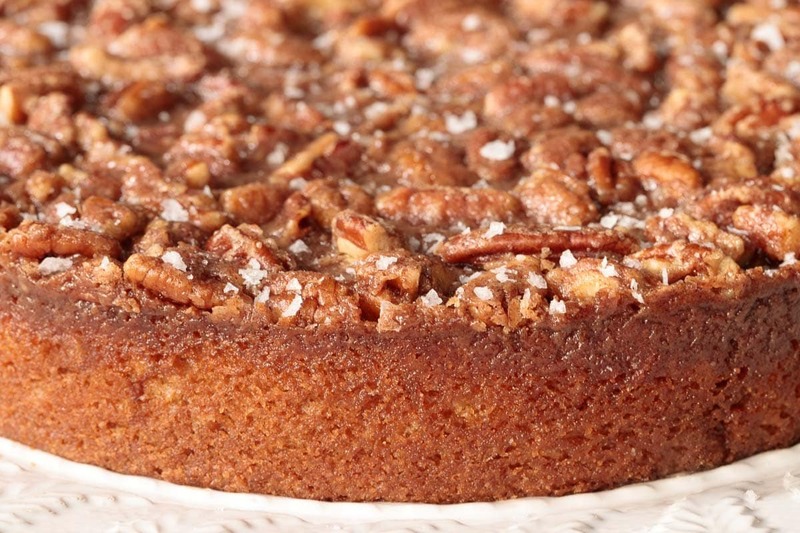 If you’re feeding a crowd, double the recipe and bake the cake in a 9×13-inch pan. Don’t skip lining the pan with parchment if you want to be able to easily remove the cake from the pan. If you want to serve the cake right from the pan, you can just grease the pan and skip the parchment paper. I love these pre-cut parchment paper circles but you can also cut your own (see image below). Everyone will flip over this moist, delicious buttermilk cake. My friends have nicknamed it "crack". No one has to know how EASY it is! Preheat the oven to 350°F. 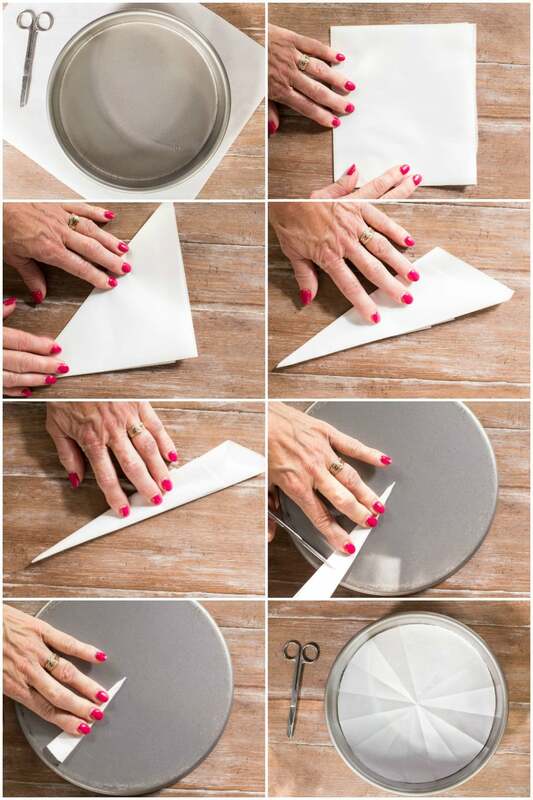 Spray a 9" round cake pan with baking spray and line with parchment paper. Set aside. Combine the butter and brown sugar and stir until smooth. Add the egg, beating again till smooth. 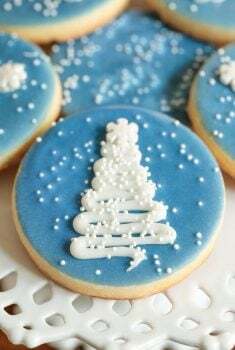 Sprinkle the flour, baking soda and salt evenly over the top and still until well combined. Bake the cake for 30 minutes or until a toothpick inserted in the center comes out clean and/or the cake springs back when lightly touched in the center. During the last 10 minutes of baking time, prepare the topping. Stir the butter and the sugar together. Add the milk, pecans, and salt. 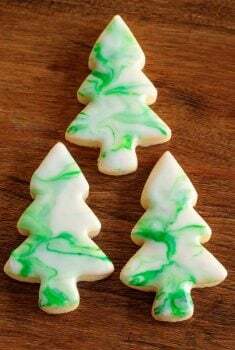 The glaze will be thick, but pourable. 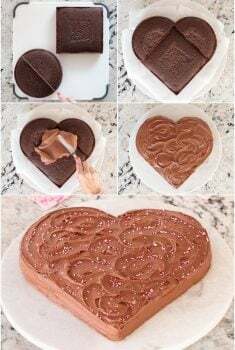 After the cake has baked for 30 minutes, pour the topping over the cake and return it to the oven for another 10 minutes (for a total baking time of 40 minutes). Remove cake from the oven and allow to cool for 20 minutes in the pan. Sprinkle lightly with flaky sea salt, if desired and serve warm or at room temperature. Topping will firm up as the cake cools. Cake can be served in the pan or on a serving platter or cake stand. To serve on a platter, invert cake onto a dinner-size plate then invert again so that topping is up. Could you perhaps provide the weight of a quarter cup of butter? A quarter cup of butter is 2 ounces or approximately 56g. There is a little metric conversion chart above the recipe that may help you with other measurements. Enjoy! 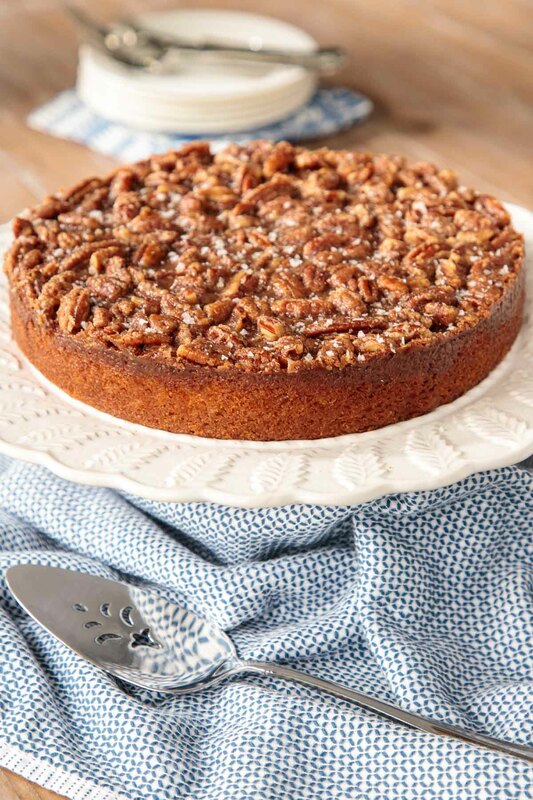 I wrote the recipe down, and called it Pecan “Crunch” Cake. Easy, and delicious. The recipe and your notes are very well explained. Thank you for a wonderful new cake recipe. We love this amazing cake. I’m making it for my son’s wedding rehearsal dinner. Just wondering when I double the recipe and use the 13×9 inch pan should I increase the baking time? Thank you for sharing the delicious recipe! Thanks so much, Mary. Congratulations on your son being married. That’s so awesome that you’ll be serving this cake at the rehearsal dinner, I love it! Yes, the baking time will be a little longer, 35 minutes, then add the topping and bake for the last 10. Cheers! I just made this cake and it looks and tastes wonderful! I used a 9 inch round cake pan and I’m just suggesting that you put a cookie sheet under the pan because mine overflowed a little bit. Maybe if my pan had more of an edge this wouldn’t have happened. Not a big deal except for the bit if smoke and smell from the bottom of my oven. 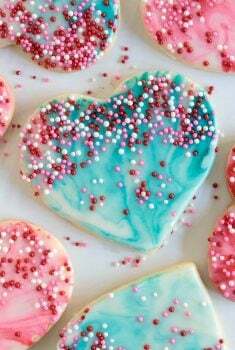 I will make this again though-I’ll just put it on a cookie sheet while baking- thanks for the recipe! That’s a good suggestion, Lisa. My cake pans are fairly tall so if you have lower ones I can see how this could be a problem. So happy you enjoyed the cake despite the smoke! Thanks for taking the time to leave a comment! You definitely could. Just make sure it’s an 8 or 9-inch springform. Otherwise, the cake will be pretty flat. Enjoy! I was wondering if this cake freezes well. Yes, it freezes beautifully! Enjoy!